Traditionally held on the last Saturday in August each summer, Saratoga’s Travers Stakes is also called the “Midsummer Derby” and is one of the highlights of the summer calendar for three-year-olds. Offering a purse of $1.25 million and running over a mile and a quarter, the Travers can be an influential race especially as connections prepare for the fall meets and the Breeders’ Cup. Saratoga has a reputation for being the “downfall of champions,” the place where great upsets can almost be expected: Man O’War faced his only career defeat here, and modern racing fans won’t forget Keen Ice’s upset victory over American Pharoah in the Travers any time soon. 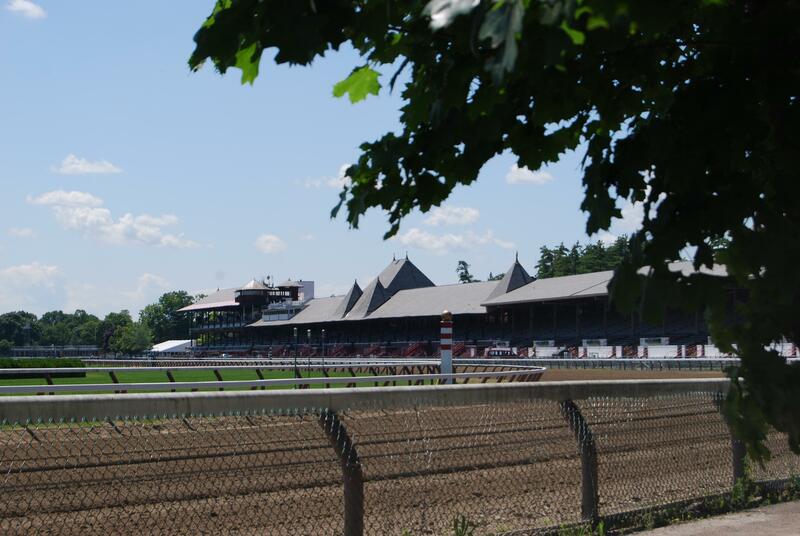 With a loaded field for Saturday’s Travers, it’ll be anyone’s game. The winners of the three Triple Crown races — Always Dreaming, Cloud Computing and Tapwrit — are all back for a “rematch,” plus several other strong contenders with multiple stakes wins. Take a look at our quick guide, and vote in our poll for who you think will win! Cloud Computing won a thrilling Preakness Stakes after coming in fresh, nipping Classic Empire just at the wire. He followed up this performance with a fifth place of five finish in Saratoga’s Grade 2 Jim Dandy, beaten by fellow Travers starters Good Samaritan, Giuseppe the Great and Always Dreaming. Chad Brown reportedly stated that the colt seemed to struggle with the track. Giuseppe the Great doesn’t have a lot of experience around two turns, but his first such race in the Jim Dandy proved that he might have the grit to fight over the distance. He finished second, half a length over Always Dreaming, behind the clear winner Good Samaritan. Still a likely long shot in the Travers but he should be fun to watch. If the tale of a Baffert trainee piloted by Mike Smith swooping in to take the Travers sounds familiar, it’s the same combination of factors that jettisoned Arrogate to superstardom last year. West Coast is coming in hot to the Spa on a three-race winning streak (making him a good deal more accomplished than Arrogate was at this time last summer), but this is the deepest field he’ll have faced in his career. Tapwrit hasn’t raced since his Belmont Stakes win — an eleven-week break. Regardless, he’s still the early favorite and his tough performances in the Kentucky Derby and Belmont are all the proof that many need that this colt is a fighter. Prior to the Jim Dandy, Good Samaritan had only run on turf. However, his commanding win on Saratoga’s dirt track put him on the map, especially considering who he conquered (such as previous classic winners Cloud Computing and Always Dreaming). He’ll be coming in off that strong win but facing an obviously deep field. Girvin won an exciting Haskell earlier this summer over some of the other stars of the Triple Crown, including Battle of Midway, Irish War Cry, Practical Joke and McCraken. The colt had a rough trip in the Kentucky Derby and skipped the rest of the classics. If he can back up his first Grade I win in the Haskell here in Saratoga, he’ll be a contender for the three-year-old division title. Always Dreaming was the undeniable star of the Kentucky Derby after dominating the Florida Derby, but he fizzled in the Preakness Stakes. The Jim Dandy went slightly better where he finished third, but the kind of performance we enjoyed in the spring has yet to make an appearance. Always Dreaming is expected to go to the pace in the Travers but it remains to be seen if he can command the entire race. Ridden by Ricardo Santana Jr.
Lookin At Lee is not the flashiest horse in the field, but he should get credit for a warhorse race record already and gritty performances. He contended all three Triple Crown races with a second place in the Kentucky Derby, and while it’s unlikely that he’ll win the Travers he should not be ruled out for another finish in the money. Ridden by Brian Hernandez Jr.
McCraken seems to be always a bridesmaid and never a bride in Grade 1 starts; he’s turned in a number of solid wins in Grade 2 and Grade 3 races. He fought gamely in last month’s Haskell only to get nipped by Girvin right at the wire, so if the race sets up in his favor perhaps the Travers will be the Grade 1 win his connections have been hoping for. Irap posted a poor Kentucky Derby to finish 18th, but since then the colt has won two graded stakes and is coming in to Saratoga on great form. He just edged Girvin in the Ohio Derby by a nose and will be rematching with some of his old foes from the Kentucky Derby for the first time on Saturday. Gunnevera had one of the best feel-good stories of the Triple Crown but never threatened in the Kentucky Derby or Preakness Stakes. He sat out the Belmont and instead won the Grade 3 Tangelo. The pace may not set up well for a closer to have much of a chance in the Travers, which is Gunnevera’s preferred running style.